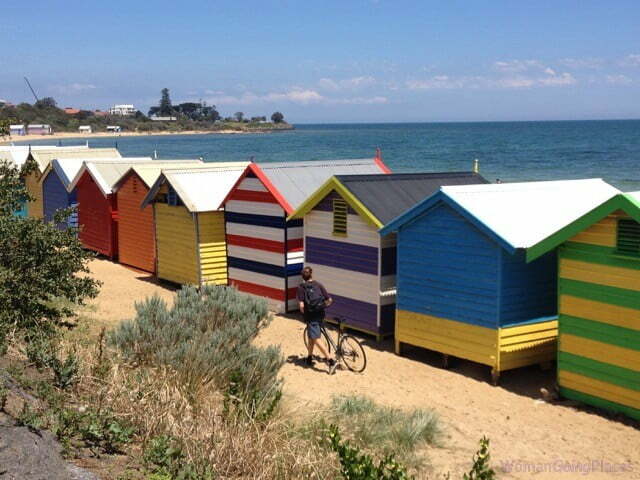 WomanGoingPlaces continues to receive such an enthusiastic response to our post on the Iconic Bathing Boxes of the Mornington Peninsula, that we are following up with another post on the bathing boxes – those on Brighton Beach. These 90 beach boxes are located in inner Melbourne, within sight of the central business district. Price of a bathing box? What would you pay for what is essentially an empty wooden box, smaller than a boat shed, without running water or electricity? Well, at the end of 2014, two auctions were held on the hot sand at Dendy St., Brighton Beach. One newly built beach box, No.57A, was sold for $215,000 – that is $44,791 per square metre. Minutes later, bidders trudged across the sand to another box, No.67, that is over 100 years old, and they eagerly pushed the sale price up to $190,000. Why are bathing boxes so valuable and why are so many people charmed by them? What is most obvious is their curious, colourful beauty. The 90 bathing boxes on Brighton beach form a vibrant arc of colour that curves along the sand and stretches to meet the skyline of Melbourne. It is a beautiful vista. Each of the boxes has its own character, shape and splashes of luminous paint. No two are identical. Then there is their history. Most of the Brighton boxes and the additional 1300 beach boxes along the Mornington Peninsula date back to the 1880’s. They were originally built so that women could modestly change into swimwear and not expose their bodies on the beach. Brighton Historical Society has records to show that there were originally more boxes in Brighton, but some were washed away or destroyed by rough weather. 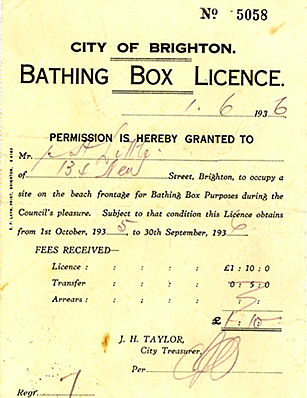 The Society retains a copy of a license dated 1936, granting permission to occupy a bathing box. Those who have been fortunate enough to own a bathing box over the last century, seem to view their boxes as a family treasure. They are much more than a convenient place to store beach gear – towels, umbrellas, chairs, canoes, boards. They are places to store family memories of summer holidays – carrying the baby, for the first time, from the beach box into the sea, swimming, playing cricket; eating meals and drinking wine on the sand outside the box while watching the sun set and rise over the sea. This repository of family celebrations by the sea is handed down from one generation to the next. For example, beach box No 67, mentioned above, which is over 100 years old, had been in the same family for 50 years. There is also another compelling reason for the desirability of the bathing boxes. They are an outstanding investment. If you had purchased one 30 years ago you would have paid around $12,000. If you waited until the 1990’s to buy one, it would have cost you around $60,000. But then you could have resold it 10 years later for $214,000. 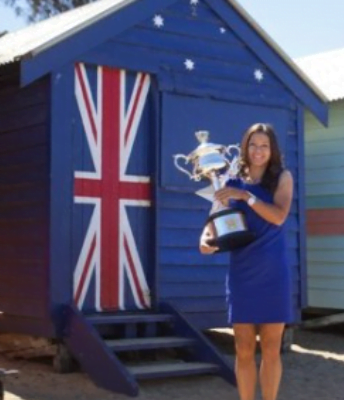 The record for a Dendy St. beach box was set in 2011 at $260,000. Their value is the reason last October, Bayside Council approved 10 more boxes on Dendy St beach, swelling its coffers by about $1.6 million. Most councils along the Mornington Peninsula have strict rules forbidding the building of new boxes. The rules and regulations governing bathing boxes date back decades and are supervised by Bathing Box Associations in each council area where the boxes are located. In Brighton there is a caveat on availability – only a bayside ratepayer can own one. Licensees are not allowed to rent or sublet their beach boxes. Nor are they allowed to sleep in or use their boxes as accommodation. There are even strict guidelines that dictate how beach boxes can be decorated. Therefore it is surprising to see one box that displays a huge blue wave, not on an Australian beach, but on the coast of Japan, with Mount Fuji in the background. The design on bathing box No. 66 is derived from a famous Japanese artwork, Under the Wave off Kanagawa. This work by Katsushika Hokusai, is one of the best recognised works of Japanese art in the world. Those who do not own a beach box are still drawn to make them part of their family memories. Each year hundreds of brides in wedding gowns traipse through the sand with their bridegrooms, bridesmaids and best men in tow, to have their wedding photos taken next to the beach boxes. This is in addition to the thousands of tourists and visitors who come to photograph and be photographed next to them. The allure of these quirky bathing boxes has made them instantly recognisable and turned them into Australian icons. To see each photo separately go to our Gallery page.